The Hadamar Euthanasia Centre (German: NS-Tötungsanstalt Hadamar) was a psychiatric hospital located in the German town of Hadamar, near Limburg in Hesse, from 1941 to 1945. Beginning in 1939, the Nazis used this site as one of six for the T-4 Euthanasia Programme, which performed mass sterilizations and mass murder of "undesirable" members of German society, specifically those with physical and mental disabilities. In total, an estimated 200,000 people were killed at these facilities, including thousands of children. These actions were in keeping with the eugenics ideas about racial purity developed by German ideologues. While officially ended in 1941, the programme lasted until the German surrender in 1945. Nearly 15,000 German citizens were transported to the hospital and died there, most killed in a gas chamber. In addition, hundreds of forced labourers from Poland and other countries occupied by the Nazis were killed there. Hadamar and its hospital fell within the American occupation zone after the war. From October 8–15, 1945, United States forces conducted the Hadamar Trial, the first mass atrocity trial in the years following World War II. 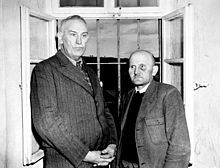 They prosecuted doctors and staff on charges of murdering citizens of allied countries, namely, forced labourers from Poland and other countries. The US had jurisdiction for these crimes under international law. Several people were convicted and executed for these crimes. After the German courts were reconstructed under the occupation, in 1946 a doctor and nurse were prosecuted by Germans for the murders of nearly 15,000 German citizens at the hospital. Both were convicted. The hospital continues to operate. It holds a memorial to the euthanasia murders as well as an exhibit about the Nazi programme. Garage of the "Grey Buses"
Since the late 19th century, doctors and scientists had been developing theories of racial purity based on eugenics, a concept popular at the time that developed from several disciplines including social history, biology, anthropology and genetics. As Weindling (1989) explained, there had been several movements in Germany since the end of World War I concerned with the 'degeneration' of German racial purity that culminated with the founding in 1927 of the Kaiser Wilhelm Institute for Anthropology, Human Heredity and Eugenics. Although there had been demands since the early 1920s for legislation on sterilisation and euthanasia, these were rejected because it was believed that positive eugenics was more representative of the Weimar political structures and the nation's social needs. This approach ended in 1933 after the ascent of the Nazis in Germany. Beginning in 1939, the Nazis set up the T-4 Euthanasia Programme at Hadamar hospital, which housed a psychiatric facility, as one of six to implement the programme. Developed by Viktor Brack, it began with mass sterilizations of children deemed "unfit" to reproduce. After that, the hospital staff exterminated children determined to be unfit and the programme was later expanded to adults. In the eight months of the first phase of the killing operations (January to August 1941), 10,072 men, women and children were asphyxiated with carbon monoxide in a gas chamber as part of the Nazi "euthanasia" programme. The gas was obtained in standard cylinders supplied by the chemicals company IG Farben. Thick smoke from the hospital crematorium billowed over Hadamar in the summer of 1941, during which the staff celebrated the cremation of their 10,000th patient with beer and wine. Despite the hospital's precautions to cover up the T-4 programme, the local population were fully aware of events at the hospital. The people murdered in the Hadamar hospital were brought in by train and bus, apparently vanishing behind the site's high fencing. Since the crematorium ovens were more often than not fed with two corpses at a time, the cremation process was less than perfect. This often resulted in the aforementioned thick, acrid smog hanging over the town. According to a letter sent by Bishop Hilfrich of Limburg to the Reich Justice Minister in 1941, local children taunted each other with the words "You're not very clever; you will go to Hadamar and into the ovens"
Up to 100 victims arrived in post-buses every day. They were told to disrobe for a "medical examination". Sent before a physician, each was recorded as having one of 60 fatal diseases, as "incurables" were to be given a "mercy death." The doctor identified each person with different-coloured sticking plasters for one of three categories: kill; kill & remove brain for research; kill & extract gold teeth. As people learned of these activities, there came growing opposition. Hitler officially announced in 1941 that the "euthanasia" activities had been curtailed. After a brief period of suspension, however, the euthanasia staff renewed the killing of 'undesirables' in 1942. Resident physicians and staff, headed by nurse Irmgard Huber, directly killed the majority of these victims, among whom were German patients with disabilities, mentally-disoriented elderly persons from bombed-out areas, "half Jewish" children from welfare institutions, psychologically- and physically-disabled forced labourers and their children, German soldiers, and foreign Waffen-SS soldiers deemed psychologically incurable. The medical personnel and staff at Hadamar killed almost all of these people by lethal drug overdoses; others died of deliberate neglect. Though the war ended in Germany on 8 May 1945, the Nazi extermination institutions continued to kill disabled patients - or allow them to die of starvation. The last known patient to die at Hadamar was a four-year-old mentally handicapped boy, who was killed on 29 May 1945. In early April 1945, the US 2nd Infantry Division captured the German town of Hadamar and American officials began to learn about the murders at the hospital. The Hadamar psychiatric hospital is in operation today as an asylum and treatment centre. It also houses a memorial to the dead and an exhibition regarding the mass murders of the Programme. Exhibit boards are installed outside the bus garage; it and the hospital itself have been designated as cultural monuments. The Hadamar Trial, October 8–15, 1945, was the first mass atrocity trial in the American occupation zone of Germany following World War II. 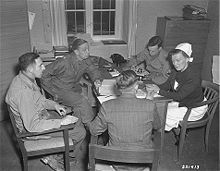 In the first months of occupation, American military forces had conducted trials based on classical violations of international law, principally for the German murders of captured Allied service personnel, which had occurred in the last months of the war. The discovery in late March 1945 of the "euthanasia" facility Hadamar near Limburg an der Lahn in west central Germany riveted attention in the United States. U.S. military authorities decided to undertake their first prosecution to adjudicate crimes associated with the systematic racial and social persecution and extermination committed under Nazi Germany policies. Initially, American authorities intended to try Hadamar physicians, nurses, and administrative staff in their custody for the murders of the nearly 15,000 German patients killed at the institution. They quickly discovered that they lacked jurisdiction to do so under international law. U.S. military officials could not try German nationals for murdering their fellow citizens. International law restricted them to prosecute crimes committed against their own service personnel and civilian nationals, and those of their allies, in the territories that they held. Among the Hadamar victims were 476 Soviet and Polish forced labourers. Identified as having tuberculosis, they were transported to Hadamar and killed at the hospital in the last months of the war. As these civilian forced laborers were citizens of countries allied to the United States, American prosecutors were able to open proceedings against seven Hadamar defendants associated with the murders of the "Eastern workers." On 15 October 1945, chief United States prosecutor Leon Jaworski (who later gained prominence in the 1970s as Watergate Special Prosecutor), won convictions for all the accused. The six-man U.S. military tribunal sentenced to death by hanging the Hadamar chief administrator Alfons Klein, and two male nurses, Heinrich Ruoff and Karl Willig. Because of his advanced age, chief physician Adolf Wahlmann, received a life sentence, which was eventually commuted. Two Hadamar administrative staff received sentences of 35 and 30 years, respectively. Irmgard Huber, a nurse and only female defendant, received the lightest sentence, that of 25 years' imprisonment. 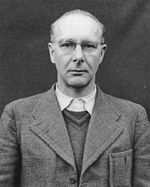 On 14 March 1946, Klein, Ruoff, and Willig were executed. In December 1945 the Allies promulgated Allied Control Council Law No. 10, which allowed the elastic charge of "crimes against humanity" to cover the massive scale of extermination the Germans had carried out against Jews, Poles, Gypsies and other populations. This charge was introduced in the indictment by the International Military Tribunal (IMT) at Nuremberg. In early 1946, "euthanasia" crimes such as those at Hadamar were transferred to the German courts, newly reconstructed under the occupation. In early 1947, a German tribunal in Frankfurt tried 25 Hadamar personnel, including Dr. Wahlmann and Nurse Huber, for the deaths of some 15,000 German patients killed at the facility. Although some had their sentences increased, most were released early in the 1950s. ^ a b Weindling, Paul (1989). "The 'Sonderweg' of German Eugenics: Nationalism and Scientific Internationalism". The British Journal for the History of Science. 22: 321–333. doi:10.1017/S0007087400026182. ^ 'My Father's Son', by Dawyck Haig (Pub. Leo Cooper, 2000) P.127. ^ Nuremberg Trial Documents USA-717 *615-PS| Letter from the Bishop of Limburg to the Reich Minister of Justice, 13 August 1941, concerning the annihilation of the "unfit to live" in the institution of Hadamar|"Du bist nicht recht gescheit, du kommst nach Hadamar in den backofen"
^ "Nazis, Eugenics, and the T-4 Program (1920-1950)". Disability Social History Project. Retrieved October 4, 2012. ^ Heberer, P. (2008) 'Early Postwar Justice in the American Zone: The ‘Hadamar Murder Factory’ Trial', in Heberer, P. & Matthäus, J. (eds.) Atrocities on Trial: Historical Perspectives on the Politics of Prosecuting War Crimes. U of Nebraska Press, pp. 25-47. Wikimedia Commons has media related to NS-Tötungsanstalt Hadamar. This page was last edited on 4 April 2019, at 14:03 (UTC).